On September 20, the Russian journal Voyennoye Obozreniye (Military Review) published a piece titled “The U.S. Foreign Policy Defeat: Why This Was Possible.” The article argued that squabbles among the U.S. political elites are undermining the traditional U.S. foreign policy, and that Washington is seeking to “destroy” Russia to protect its “threatened” global hegemony. The article’s author, Yuri Podoliaka, also made the following claim: “Today, Washington is losing allies even faster than the USSR did during its period of decline. Old and experienced [U.S.] partners are turning in the direction of Russia and China, and many are simply waiting for the right moment to escape the sinking ship of American ‘democracy’." There are, however, a number of facts and considerations that invalidate this claim. For one, twists and turns in relations between allies are a regular feature of international affairs, since countries adapt to evolving, complex geopolitical dynamics in pursuing their interests. Today, these dynamics include Russia’s military resurgence and China’s and India’s economic rise, which challenge the foreign policy of both the U.S. and its allies. Yet, these dynamics make it imperative for Washington to maintain its commitments to allies while emphasizing common goals in countering threats and harnessing opportunities. 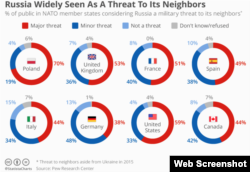 ​In the Transatlantic sphere, the United States remains the pillar of the North Atlantic Treaty Organization (NATO), a military alliance that includes the U.S., Canada and European countries. U.S. President Donald Trump and Vice President Mike Pence have both declared that the U.S. is firmly committed to the defense of its NATO allies amid concerns of potential Russian military aggression against Europe. “Make no mistake, our commitment is unwavering. We will meet our obligations to our people to provide for the collective defense of all of our allies....An attack on one of us is an attack on all of us,” Pence said, referring to U.S. defense obligations to its NATO allies. The United States has also expanded cooperation with eastern and central European states, both within and outside the NATO and European Union frameworks of cooperation. Many of these states became NATO members in the 1990s and 2000s, following the dissolution of the Soviet Union and the Warsaw Pact, the Moscow-led military alliance. Today, former Soviet republics like Ukraine and Georgia are seeking NATO and the EU membership. ​The United States is also cultivating relationships with potential new allies in the Indo-Asia-Pacific region, including India and Vietnam, erstwhile allies of Moscow which – at least according to one Russian media outlet – are moving into Washington’s orbit. Meanwhile, Australia, India, Indonesia, Malaysia, Thailand, Vietnam, and the Philippines all rely on Washington to help counter China’s aggressive maritime actions and ensure regional security through freedom of navigation patrols, and security and defense cooperation. The United States is unwavering in its commitment to defend Japan and South Korea, especially against threats posed by an increasingly belligerent North Korea. “Any attack on the United States, or our allies, will be defeated, and any use of nuclear weapons would be met with a response that would be effective and overwhelming,” U.S. Defense Secretary Jim Mattis said in February amid reports that Pyongyang was preparing to test a ballistic missile. Japan, South Korea, and Australia ­– all of which have defense treaties with the United States – have pledged to support U.S. and allied efforts to address the threats. “America stands by its allies, including Australia of course, and we stand by the United States,” Australian Prime Minister Malcolm Turnbull stated, commenting on North Korea’s threats. In the greater Middle East, Washington provides security for the Persian Gulf, protecting oil supplies and the Gulf states amid concerns over Iran’s regional ambitions. Iraq and Afghanistan rely on Washington and U.S.-led multinational coalitions to help with the fight against the Islamic State and the Taliban. In contrast, Russia has alienated traditional and potential allies alike. 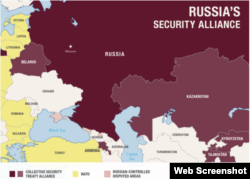 The former Soviet republics that comprise the Russia-led Collective Security Treaty Organization (CSTO) alliance distrust Moscow and are seeking closer ties with the United States despite Russia’s pressure. Russia’s annexation of Crimea, involvement in the conflict in eastern Ukraine, and war with Georgia have prompted Kyiv and Tbilisi, as well as eastern and central European states, to seek a deeper strategic engagement with the United States and the EU rather than with Russia. Meanwhile, the U.S. and its allies continue to enforce sanctions on Russia for its actions in Ukraine. In Syria, Russia’s CSTO allies are not to be found, while the U.S. leads a multi-national coalition there. ​Finally, Russia’s authoritarian political system has made it a far less appealing business partner for existing and prospective allies compared to the more democratic and thriving United States.